Qatar‘s economy has continuously shown a promising growth over the years and is anticipated to witness tremendous infrastructure development owing to upcoming FIFA World Cup 2022. To build the infrastructure for the mega event, a whopping $300 billion would be invested in the country across various sectors. To improve the security for these rising infrastructures, demand for security systems such as access control systems is exhibited to increase. According to 6Wresearch, Qatar Access Control market is projected to grow at a CAGR of 12.52% during 2015-21. In 2014, card reader access control system accounted for lion share in the overall market followed by biometric access control system. However, during the forecast period, installation of biometric access control systems would increase due to declining prices and need for enhanced security. Biometrics would grow in banking, government & transportation and commercial sectors whereas card reader access control market would grow in hospitality and retail sectors. 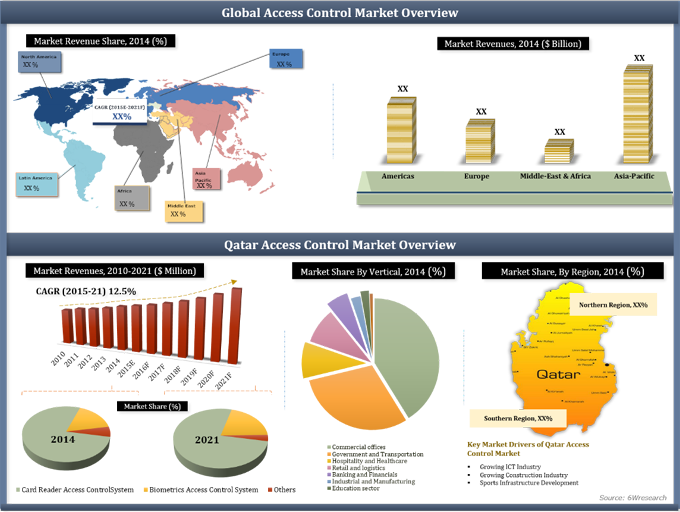 “Qatar's Access Control Market (2015-2021)” provides in-depth analysis with 61 figures and 21 tables covered in 130 pages. The report thoroughly covers the market by card reader access control system, biometric access control system and other access control system types, by applications, and regions. The report provides the unbiased and detailed analysis of the on-going trends, opportunities/high growth areas, market drivers which would help the stakeholders to device and align their market strategies according to the current and future market dynamics. 13.7	Lenel Systems International, Inc.
Qatar Access Control Market is expected to grow at relatively higher growth rate than other GCC countries. Upcoming FIFA world Cup 2022 is seen as major driving force for the demand for electronic security systems such as access control systems in the country. Large number of mega projects such as Doha Metro, Airport, Lusail City and Barwa City would open new opportunities to the market players. In Qatar Access Control Market, Card Reader Access Control systems have captured the major share in overall access control market mainly due to growing demand for contactless card reader system in various applications including commercial, government & transportation and retail.